Providence, Rhode Island was founded in 1636 by Roger Williams. Williams was a Puritan, and his unconventional beliefs including the ideas of separation of Church and State as well as religious freedom, brought him into conflict with the Massachusetts General Court. He was banished in 1635, and decided to start his own settlement. This colony, Providence, was a place where people were free to be who they were. In honor of the 300th anniversary of the founding of the city, the Rhode Island and Providence Plantations Tercentenary Committee was founded. They sought a coin commemorating the founding of Providence, and on May 2, 1935, a mintage of 50,000 coins from the three mints was authorized. 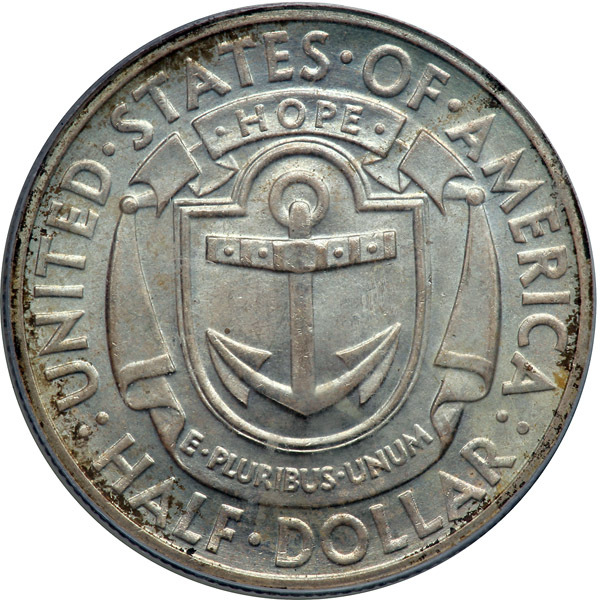 John Howard Benson, an instructor at the Rhode Island School of Design, and silversmith Arthur Graham Carey were selected to design the coin. 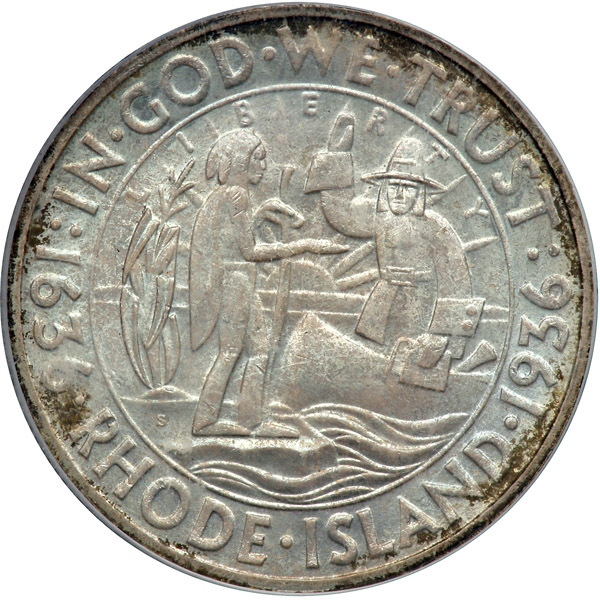 Their obverse features Roger Williams coming ashore in a small boat with a Bible in his hand. He is being greeted by a Native American whose hand is extended as if to help him disembark. A stalk of corn is to their left, and a sunset is seen behind them. IN GOD WE TRUST and RHODE ISLAND are on the top and bottom periphery, with 1636 and 1936 separating them at 9 and 3 o’ clock respectively. 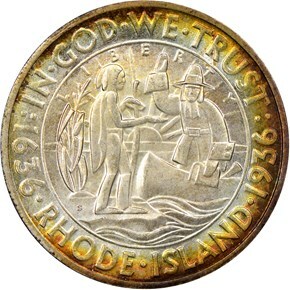 The reverse is dominated by a representation of the state seal of Rhode Island. 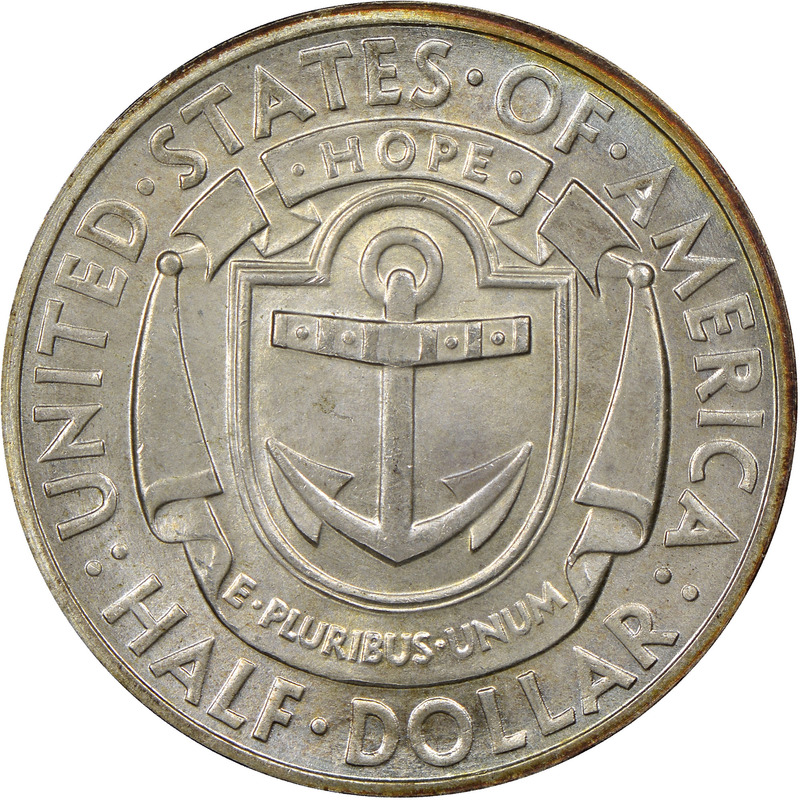 The seal features a boat anchor at its center with the word HOPE above. 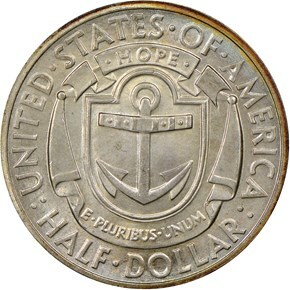 E PLURIBUS UNUM is seen below, and UNITED STATES OF AMERICA and HALF DOLLAR are arranged around the periphery. The Philadelphia Mint struck 20,000 coins in January, which was followed the following month by Denver and San Francisco’s minting of 15,000 each. They were to be distributed by the Rhode Island Hospital National Bank and prominent coin dealer Horace M. Grant. The demand seems to have met the supply in this coin’s case, as no coins were returned to the mint for melting.